On country drives you've seen those simple sanctuaries, and they have restored your soul: Serene, eternal grace notes that transcend modern mundane. 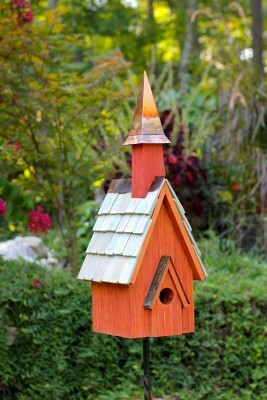 And now a lovely country church can take up residence in your yard or garden and drive away humdrum with a sky full of your favorite flock. Rustic red cypress with weathered grey shingles means true grace under pressure of all-season weather, so that year after year Pineywoods Chapel abides and abounds with birds.